There is one post tagged fiat. When in Rome, ape the locals. Or at least try to act like you know your way around. This is not difficult, especially for Filipino tourists visiting the Eternal City for the very first time. Filipinos, after all, are to cultural adaptation as the Chinese are to producing pirated DVDs. And just like illegally-copied video discs, the said Filipino trait remains unfettered by regional restrictions. But then again, this trait — as far as Rome goes — appears to be irrelevant. Romans are still likely to be irritated whenever strangers interrupt their routines by asking them for directions. Just like sharp-tongued New Yorkers, Romans have perhaps nurtured a dislike for tourists, simply because their city has too many of them, Filipinos or otherwise. Besides clogging buses and trains, these visitors delay pedestrian traffic by reading street signs, studying maps, and posing for pictures. How does it feel like to live in a city absolutely swamped with visiting foreigners? I barely have an idea. I live in a city notorious for being the Philippines’ squatter capital and I’m pretty sure that that’s not a top tourist attraction. 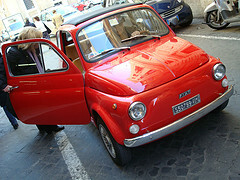 This picture was taken in Rome after being awed by the Fiat 500. What I do know is that for the first half of 2006, approximately six million people visited Rome. The Philippines — which is 60 times larger than Rome — only had 2.8 million visitors during the same year. There is a shortage of Romans patient enough to give directions to the next bus stop while there is a surplus of Filipinos — at least 30 to a tourist — all too willing to answer any questions under the sun, proud of their abilities to communicate using broken English, complemented by various hand and facial gestures. This discrepancy posed a problem for my wife and I when we were about to leave Rome and the bus we needed to catch was running late. If we missed the bus to the train station, it might take awhile before we could board a train to the airport. A later train to the airport might mean a delayed connection to Paris, compromising the last stop of our European adventure. We had become so desperate that we considered taking a cab. The idea was quickly dismissed when I learned that it might cost me an arm, a leg, and my other organs, unsavory and otherwise. Why was the bus late? I didn’t know but I was tasked to find out. Armed with my poor English speaking skills and my atrocious Italian, I ambled to the station attendant and asked when was the bus arriving. She answered me in broken English and then she shooed me off. Were my questions being dismissed outright because I wasn’t white? Was I making a fool of myself because I didn’t know how to speak their language properly? Was I being treated unfairly because I was overweight and therefore used more soap than thin people? As I sat beside my wife in the waiting area, I saw various other tourists — some of whom spoke in English — getting the same treatment that I got. They asked the same set of questions that I asked but they were summarily dismissed, like appeals of lawyers with losing court cases. Not long after, the bus arrived, making us consider the incident with some measure of fondness. (We did catch the plane to Paris, after all). My wife and I loved Rome — we still do — despite having stayed for less than a week. And no bus station attendant, no matter how ill-tempered, was about to ruin that memory for us.